This article is about WWE's original world tag team championship. For other championships, see WWE Tag Team Champions (disambiguation). The World Tag Team Championship was a professional wrestling World Tag Team championship in World Wrestling Entertainment (WWE). It was unified with the WWE Tag Team Championship, which WWE recognized as the "Unified WWE Tag Team Championship". On August 16, 2010 the World Tag Team Championship was decommissioned in favor of continuing the lineage of the WWE Tag Team Championship. Some reigns were held by champions using a ring name, while others used their real name. There have been a total of 113 recognized teams and 164 recognized individual champions, who have had a combined 176 official reigns. The first champions were Luke Graham and Tarzan Tyler and the final champions were The Hart Dynasty (David Hart Smith and Tyson Kidd). 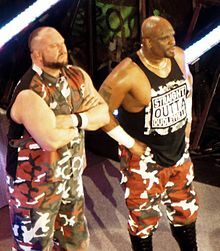 The team with the most reigns is The Dudley Boyz (Bubba Ray Dudley and D-Von Dudley) with eight. Edge has the most individual reigns with twelve. Two tag teams have held the titles for 365 or more days: Demolition, whose first reign set the record at 478 days and The Valiant Brothers. Demolition is also the team with the longest combined reign at 698 days, while Mr. Fuji has the longest combined reign as an individual at 932 days. The following is a chronological list of teams that have been World Tag Team Champions by ring name. Ric Flair (3) and Roddy Piper November 5, 2006 Cyber Sunday Cincinnati, OH 1 7000800000000000000♠8 Piper was voted into this match via web poll. 1 During Demolition's third reign, Crush was added to the team, and the three of them defended the titles under the Freebird Rule for approximately 90 days. ^ a b c d e f g h i j k l m n o p q r s t u v w x y z aa ab ac ad ae "History of the World Tag Team Championship". WWE. Retrieved 2007-05-11. ^ a b c d e f g h i j k l m n "WWE World Tag Team Title". The Meltdown. Archived from the original on 2008-04-23. Retrieved 2007-05-11. ^ Hoops, Brian (May 13, 2015). "On this day in pro wrestling history (May 13): Rick Martel wins AWA gold, Kurt Angle wins TNA title, Nash & Hall beat one man to win tag titles". Wrestling Observer Figure Four Online. Retrieved February 11, 2017. ^ "The Samoans' third reign". WWE. Archived from the original on 2005-11-04. Retrieved 2007-05-25. ^ "Atlas & Johnson's first reign". WWE. Archived from the original on 2005-11-29. Retrieved 2007-05-25. ^ "Adonis & Murdoch's first reign". WWE. Archived from the original on 2005-12-31. Retrieved 2007-05-25. ^ "US Express' first reign". WWE. Archived from the original on 2005-11-29. Retrieved 2007-05-25. ^ "Iron Sheik and Volkoff's first reign". WWE. Archived from the original on 2005-12-31. Retrieved 2007-05-25. ^ "US Express' second reign". WWE. Archived from the original on 2005-11-29. Retrieved 2007-05-25. ^ "Dream Team's first reign". WWE. Archived from the original on 2005-12-31. Retrieved 2007-05-25. ^ "British Bulldogs' first reign". WWE. Archived from the original on 2005-11-29. Retrieved 2007-05-25. ^ "Hart Foundation's first reign". WWE. Archived from the original on 2005-11-29. Retrieved 2007-05-25. ^ "Strike Force's first reign". WWE. Archived from the original on 2005-11-23. Retrieved 2007-05-25. ^ "Demolition's first reign". WWE. Archived from the original on 2005-11-23. Retrieved 2007-05-25. ^ "Brain Busters' first reign". WWE. Archived from the original on 2005-11-29. Retrieved 2007-05-25. ^ "Demolition's second reign". WWE. Archived from the original on 2005-12-31. Retrieved 2007-05-25. ^ "Colossal Connection's first reign". WWE. Archived from the original on 2005-07-20. Retrieved 2007-05-25. ^ "Demolition's third reign". WWE. Archived from the original on 2005-11-28. Retrieved 2007-05-25. ^ a b "Hart Foundation's second reign". WWE. Archived from the original on 2005-11-27. Retrieved 2007-05-25. ^ "The Nasty Boys' first reign". WWE. Archived from the original on 2005-11-26. Retrieved 2007-05-25. ^ "Legion of Dooms' first reign". WWE. Archived from the original on 2005-07-26. Retrieved 2007-05-25. ^ "Money, Inc.'s first reign". WWE. Archived from the original on 2005-11-29. Retrieved 2007-05-25. ^ "Natural Disasters' first reign". WWE. Archived from the original on 2005-11-30. Retrieved 2007-05-25. ^ Hoops, Brian (July 20, 2015). "On this day in pro wrestling history: Brisco beats Race for NWA title, Gagne beats Crusher for AWA title, Robinson vs. Gagen". Wrestling Observer Figure Four Online. Retrieved February 11, 2017. ^ "Money, Inc.'s second reign". WWE. Archived from the original on 2005-12-31. Retrieved 2007-05-25. ^ "Steiner Brothers' first reign". WWE. Archived from the original on 2005-07-25. Retrieved 2007-05-25. ^ "Money, Inc.'s third reign". WWE. Archived from the original on 2005-12-31. Retrieved 2007-05-25. ^ "Steiner Brothers' second reign". WWE. Archived from the original on 2005-11-27. Retrieved 2007-05-25. ^ "The Quebecers' first reign". WWE. Archived from the original on 2005-12-31. Retrieved 2007-05-25. ^ "1–2–3 Kid & Jannetty's first reign". WWE. Archived from the original on 2005-11-29. Retrieved 2007-05-25. ^ "The Quebecers' second reign". WWE. Archived from the original on 2005-11-29. Retrieved 2007-05-25. ^ "Men on a Mission first reign". WWE. Archived from the original on 2005-12-31. Retrieved 2007-05-25. ^ "The Quebecers' third reign". WWE. Archived from the original on 2005-12-31. Retrieved 2007-05-25. ^ "The Headshrinkers' first reign". WWE. Archived from the original on 2005-12-31. Retrieved 2007-05-25. ^ "Diesel & HBK's first reign". WWE. Archived from the original on 2005-12-31. Retrieved 2007-05-25. ^ a b "1–2–3 Kid and Holly's first reign". WWE. Archived from the original on 2005-11-24. Retrieved 2007-05-24. ^ "Smokin' Gunns' first reign". WWE. Archived from the original on 2006-01-02. Retrieved 2007-05-24. ^ "Owen Hart & Yokozuna's first reign". WWE. Archived from the original on 2005-10-01. Retrieved 2007-05-24. ^ "Diesel & HBK's second reign". WWE. Archived from the original on 2005-07-25. Retrieved 2007-05-24. ^ "Owen Hart & Yokozuna's second reign". WWE. Archived from the original on 2005-12-31. Retrieved 2007-05-24. ^ "Smokin' Gunns' second reign". WWE. Archived from the original on 2005-11-23. Retrieved 2007-05-24. ^ a b "The Bodydonnas' first reign". WWE. Archived from the original on 2005-12-31. Retrieved 2007-05-24. ^ "The Godwinns' first reign". WWE. Archived from the original on 2005-12-31. Retrieved 2007-05-24. ^ "Smokin' Gunns' third reign". WWE. Archived from the original on 2005-12-31. Retrieved 2007-05-24. ^ "Bulldog & Owen Hart's first reign". WWE. Archived from the original on 2005-11-06. Retrieved 2007-05-24. ^ "Austin & HBK's first reign". WWE. Archived from the original on 2005-11-29. Retrieved 2007-05-24. ^ a b "Austin & Dude Love's first reign". WWE. Archived from the original on 2005-11-30. Retrieved 2007-05-24. ^ a b "The Headbangers' first reign". WWE. Archived from the original on 2005-11-27. Retrieved 2007-05-24. ^ "The Godwinns' second reign". WWE. Archived from the original on 2005-12-31. Retrieved 2007-05-24. ^ "Legion of Doom's second reign". WWE. Archived from the original on 2005-07-25. Retrieved 2007-05-24. ^ "New Age Outlaws' first reign". WWE. Archived from the original on 2005-11-23. Retrieved 2007-05-24. ^ "Cactus Jack & Chainsaw Charlie's first reign". WWE. Archived from the original on 2005-06-30. Retrieved 2007-05-24. ^ "New Age Outlaws' second reign". WWE. Archived from the original on 2005-12-16. Retrieved 2007-05-24. ^ "Kane & Mankind's first reign". WWE. Archived from the original on 2005-11-04. Retrieved 2007-05-24. ^ "Austin & Undertaker's first reign". WWE. Archived from the original on 2005-11-25. Retrieved 2007-05-24. ^ "Kane & Mankind's second reign". WWE. Archived from the original on 2005-11-29. Retrieved 2007-05-24. ^ "New Age Outlaws' third reign". WWE. Archived from the original on 2005-11-27. Retrieved 2007-05-24. ^ "Boss Man & Shamrock's first reign". WWE. Archived from the original on 2005-11-29. Retrieved 2007-05-24. ^ "Jarrett & Owen Hart's first reign". WWE. Archived from the original on 2005-11-29. Retrieved 2007-05-24. ^ "Kane & X-Pac's first reign". WWE. Archived from the original on 2005-11-06. Retrieved 2007-05-24. ^ "The Acolytes' first reign". WWE. Archived from the original on 2005-12-31. Retrieved 2007-05-24. ^ "The Hardy Boyz' first reign". WWE. Archived from the original on 2005-11-29. Retrieved 2007-05-24. ^ "The Acolytes' second reign". WWE. Archived from the original on 2005-11-28. Retrieved 2007-05-24. ^ "Kane & X-Pac's second reign". WWE. Archived from the original on 2005-11-23. Retrieved 2007-05-24. ^ "The Big Show & The Undertaker's first reign". WWE. Archived from the original on 2005-11-26. Retrieved 2007-05-24. ^ "Rock 'n' Sock Connection's first reign". WWE. Archived from the original on 2005-11-29. Retrieved 2007-05-24. ^ "The Big Show & The Undertaker's second reign". WWE. Archived from the original on 2005-10-13. Retrieved 2007-05-24. ^ "Rock 'n' Sock Connection's second reign". WWE. Archived from the original on 2005-11-27. Retrieved 2007-05-24. ^ "New Age Outlaws' fourth reign". WWE. Archived from the original on 2005-11-23. Retrieved 2007-05-24. ^ "Rock 'n' Sock Connection's third reign". WWE. Archived from the original on 2005-11-28. Retrieved 2007-05-24. ^ "The Hollys' first reign". WWE. Archived from the original on 2005-12-30. Retrieved 2007-05-24. ^ "Mankind & Snow's first reign". WWE. Archived from the original on 2005-11-23. Retrieved 2007-05-24. ^ "New Age Outlaws' fifth reign". WWE. Archived from the original on 2005-12-31. Retrieved 2007-05-24. ^ "The Dudley Boyz' first reign". WWE. Archived from the original on 2005-12-30. Retrieved 2007-05-24. ^ "Edge & Christian's first reign". WWE. Archived from the original on 2005-11-29. Retrieved 2007-05-24. ^ "Too Cool's first reign". WWE. Archived from the original on 2005-07-06. Retrieved 2007-05-24. ^ "Edge & Christian's second reign". WWE. Archived from the original on 2005-07-06. Retrieved 2007-05-24. ^ "The Hardy Boyz' second reign". WWE. Archived from the original on 2005-06-29. Retrieved 2007-05-24. ^ "Edge & Christian's third reign". WWE. Archived from the original on 2005-11-29. Retrieved 2007-05-24. ^ "The Hardy Boyz' third reign". WWE. Archived from the original on 2006-05-09. Retrieved 2007-05-24. ^ "Right to Censor's first reign". WWE. Archived from the original on 2005-12-31. Retrieved 2007-05-24. ^ "Edge & Christian's fourth reign". WWE. Archived from the original on 2005-11-26. Retrieved 2007-05-24. ^ "Rock & Undertaker's first reign". WWE. Archived from the original on 2005-07-19. Retrieved 2007-05-23. ^ "Edge & Christian's fifth reign". WWE. Archived from the original on 2005-07-06. Retrieved 2007-05-23. ^ "The Dudley Boyz' second reign". WWE. Archived from the original on 2005-12-31. Retrieved 2007-05-23. ^ "The Hardy Boyz' fourth reign". WWE. Archived from the original on 2005-12-30. Retrieved 2007-05-23. ^ "Edge & Christian's sixth reign". WWE. Archived from the original on 2005-11-04. Retrieved 2007-05-23. ^ "The Dudley Boyz' third reign". WWE. Archived from the original on 2005-12-31. Retrieved 2007-05-23. ^ "Edge & Christian's seventh reign". WWE. Archived from the original on 2005-11-29. Retrieved 2007-05-23. ^ "Brothers of Destruction's first reign". WWE. Archived from the original on 2005-11-04. Retrieved 2007-05-23. ^ "Two-Man Power Trip's first reign". WWE. Archived from the original on 2005-12-31. Retrieved 2007-05-23. ^ "The Dudley Boyz' fourth reign". WWE. Archived from the original on 2005-11-23. Retrieved 2007-05-23. ^ "The APA's third reign". WWE. Archived from the original on 2005-11-25. Retrieved 2007-05-23. ^ "DDP & Kanyon's first reign". WWE. Archived from the original on 2005-12-31. Retrieved 2007-05-23. ^ "Brothers of Destruction's second reign". WWE. Archived from the original on 2005-07-19. Retrieved 2007-05-23. ^ "The Dudley Boyz' fifth reign". WWE. Archived from the original on 2005-12-16. Retrieved 2007-05-23. ^ "Jericho & Rock's first reign". WWE. Archived from the original on 2005-11-25. Retrieved 2007-05-23. ^ "Booker T & Test's first reign". WWE. Archived from the original on 2005-12-31. Retrieved 2007-05-23. ^ "The Hardy Boyz' fifth reign". WWE. Archived from the original on 2005-12-31. Retrieved 2007-05-23. ^ "The Dudley Boyz' sixth reign". WWE. Archived from the original on 2005-11-29. Retrieved 2007-05-23. ^ "Spike & Tazz' first reign". WWE. Archived from the original on 2005-12-31. Retrieved 2007-05-23. ^ "Billy & Chuck's first reign". WWE. Archived from the original on 2005-11-27. Retrieved 2007-05-23. ^ "Rico & Rikishi's first reign". WWE. Archived from the original on 2005-11-27. Retrieved 2007-05-23. ^ "Billy & Chuck's second reign". WWE. Archived from the original on 2005-11-28. Retrieved 2007-05-23. ^ "Edge & Hogan's first reign". WWE. Archived from the original on 2005-11-23. Retrieved 2007-05-23. ^ "The Un-Americans' first reign". WWE. Archived from the original on 2005-11-29. Retrieved 2007-05-23. ^ "Hurricane and Kane's first reign". WWE. Archived from the original on 2005-11-06. Retrieved 2007-05-23. ^ "Christian and Jericho's first reign". WWE. Archived from the original on 2005-12-31. Retrieved 2007-05-23. ^ "Booker T and Goldust's first reign". WWE. Archived from the original on 2005-11-20. Retrieved 2007-05-23. ^ "Regal & Storm's first reign". WWE. Archived from the original on 2005-11-29. Retrieved 2007-05-23. ^ "The Dudley Boyz' seventh reign". WWE. Archived from the original on 2005-11-28. Retrieved 2007-05-23. ^ "Regal & Storm's second reign". WWE. Archived from the original on 2005-11-29. Retrieved 2007-05-23. ^ a b "Morley & Storm's first reign". WWE. Archived from the original on 2005-11-29. Retrieved 2007-05-23. ^ "Kane & RVD's first reign". WWE. Archived from the original on 2005-11-23. Retrieved 2007-05-23. ^ "Duprée & Grenier's first reign". WWE. Archived from the original on 2005-11-23. Retrieved 2007-05-23. ^ "The Dudley Boyz' eighth reign". WWE. Archived from the original on 2005-11-23. Retrieved 2007-05-23. ^ "Evolution's first reign". WWE. Archived from the original on 2005-07-10. Retrieved 2007-05-23. ^ "Booker T & RVD's first reign". WWE. Archived from the original on 2005-07-06. Retrieved 2007-05-23. ^ "Evolution's second reign". WWE. Archived from the original on 2005-11-25. Retrieved 2007-05-23. ^ "Benoit & Edge's first reign". World Wrestling Entertainment (via Internet Archive). Archived from the original on 2007-05-16. Retrieved 2007-05-23. ^ "Conway & Grenier's first reign". WWE. Archived from the original on 2005-08-10. Retrieved 2007-05-23. ^ "Benoit & Edge's second reign". World Wrestling Entertainment (via Internet Archive). Archived from the original on 2007-06-17. Retrieved 2007-05-23. ^ "Conway & Grenier's second reign". WWE. Archived from the original on 2005-11-29. Retrieved 2007-05-23. ^ "Eugene & Regal's first reign". WWE. Archived from the original on 2005-10-01. Retrieved 2007-05-23. ^ "Conway & Grenier's third reign". WWE. Archived from the original on 2005-11-25. Retrieved 2007-05-23. ^ "Regal & Tajiri's first reign". WWE. Archived from the original on 2005-11-25. Retrieved 2007-05-23. ^ "Hurricane & Rosey's first reign". WWE. Archived from the original on 2005-11-25. Retrieved 2007-05-23. ^ "Cade & Murdoch's first reign". WWE. Archived from the original on 2005-10-01. Retrieved 2007-05-23. ^ "Big Show & Kane's first reign". WWE. Archived from the original on 2005-11-04. Retrieved 2007-05-23. ^ "The Spirit Squad's first reign". WWE. Archived from the original on 2006-04-12. Retrieved 2007-05-23. ^ "Flair & Piper's first reign". WWE. Archived from the original on 2006-12-11. Retrieved 2007-05-23. ^ "Rated-RKO's first reign". WWE. Archived from the original on 2006-12-06. Retrieved 2007-05-23. ^ "Cena & HBK's first reign". WWE. Archived from the original on 2007-02-02. Retrieved 2007-05-23. ^ "The Hardys' sixth reign". WWE. Archived from the original on 2007-04-06. Retrieved 2007-05-23. ^ "Cade & Murdoch's second reign". WWE. Archived from the original on 2007-06-07. Retrieved 2007-06-04. ^ "London & Kendrick's first reign". WWE. Archived from the original on 2007-10-11. Retrieved 2007-09-09. ^ "Cade & Murdoch's third reign". WWE. Archived from the original on 2007-10-11. Retrieved 2007-09-09. ^ "Holly & Rhodes' first reign". WWE. Archived from the original on 2007-12-13. Retrieved 2007-12-11. ^ "DiBiase's and Rhodes' first reign". WWE. Archived from the original on 2008-07-03. Retrieved 2008-06-29. ^ "Batista and John Cena's first reign". WWE. Archived from the original on 2008-08-08. Retrieved 2008-08-05. ^ "DiBiase's and Rhodes's second reign". WWE. Archived from the original on 2008-08-15. Retrieved 2008-08-12. ^ "Punk and Kingston's first reign". WWE. Archived from the original on 2008-10-31. Retrieved 2008-10-28. ^ "Morrison and Miz's first reign". WWE. Archived from the original on 2008-12-17. Retrieved 2008-12-14. ^ "The Colóns first reign". WWE. Archived from the original on 2009-04-08. Retrieved 2009-04-16. ^ "Edge & Chris Jericho's first reign". WWE. Archived from the original on 2010-02-11. Retrieved 2010-09-20. ^ "Chris Jericho & Big Show's first reign". WWE. Archived from the original on 2010-02-11. Retrieved 2010-09-20. ^ "Jericho's title history". WWE. Retrieved 2014-10-18. ^ "D-Generation X's first reign". WWE. Archived from the original on 2009-12-17. Retrieved 2009-12-14. ^ "ShoMiz's first reign". WWE. Archived from the original on 2010-02-17. Retrieved 2010-10-24. ^ "The Hart Dynasty's first reign". WWE. Archived from the original on 2010-08-24. Retrieved 2010-10-24. ^ "Raw Results 8/16/10". Online World of Wrestling. Archived from the original on June 3, 2013. Retrieved November 2, 2013. Michael Cole got an email saying that the unified tag team title would now be known as the WWE tag team championships, and Bret Hart would present the new titles. ^ "Demolition's tag team profile". Retrieved March 2, 2011.